Emory Oaks Hawthorne Homes: $30,000 PRICE REDUCTION! SELLER IS MOTIVATED. One of the best long lake views in Hawthorne! Enjoy watching the sun rise over the lake from this well appointed 3 bedroom, 2 bathroom, 2 car side load garage single home. The large gourmet kitchen includes 42 inch wood cabinets, granite counter, stainless appliances, pantry and island. Living room, family room, formal dining, split bedrooms , and spacious master suite give you plenty of space for privacy of each member of your family as well as for entertainment. New a/c unit, tray ceiling in Master suite,16-inch diagonal tile in the living area and wood floor in all bedrooms. 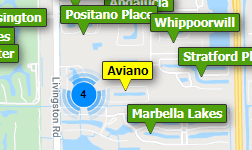 Hawthorne is 10 minutes to Bonita Beach, and 20 minutes to the airport and to Naples. Amenities include 2 pools, hot tub, tennis courts, exercise room, and club house. Community is conveniently located right across from the new Bonita High School. Emory Oaks Hawthorne Homes: This well designed developer's former model home sits on one of the finest long lake view lots in this gated neighborhood. Built to the latest hurricane codes and upgraded with electric shutters on the lanai and entry, this home offers over 2500 square feet of living area with three bedrooms, a den and two and a half bathrooms. Beautifully maintained, the home lives comfortably with a great room floor plan, split bedrooms, spacious kitchen, formal dining room, and volume ceilings. Upgraded lighting fixtures and ceiling fans, a custom wood and granite built-in with a wine refrigerator in the great room, wood floors in the den, stainless steel appliances, granite countertops, wood cabinetry, plantation shutters, custom valances and window coverings, tray ceilings and art niches are a few of the fine architectural features. The spacious private outdoor living space offers a screened custom freeform pool and spa with a panoramic lake view. The den, morning room, great room, and master bedroom all have spectacular long lake views. A rare offering in this community that has fitness centers, pools and spas, tennis courts, and social rooms. Cobblestone Hawthorne Homes: H.14278 - This Hawthorne pool/spa home has all of the upgrades, and has been meticulously maintained. Master bedroom conveniently located on the first floor with walk in closets,tub and shower, and beautiful pool views through the sliding glass doors. Guests will enjoy privacy in their second floor retreat with media room, and private bath. This home has an oversized lot with approximately 25 feet separation between the neighbors. Inside,the kitchen cabinets are upgraded high level glazed finish with crown molding. Other upgrades include tumble marble backsplash with granite tops and stainless appliances.Plantation shutters on windows, and privacy blinds on the sliding glass doors. Two zone AC system provides extra comfort and convenience for you and your guests. Outside, the heated pool and spa offer a great space to enjoy the sunset, or entertain. Hawthorne is very conveniently located near Bonita Beach, shopping, and restaurants. Community amenities include well equipped fitness center, pool/spa, tennis, and community room perfect for parties and events. We welcome you to view this beautiful home today! Emory Oaks Hawthorne Homes: From the moment you enter through the glass front door, the stunning pool and serene preserve view capture your attention. Immaculate details pair with open floor plan in this ready to move in, very well-kept home. The desirable Salem model floor plan features three bedrooms and an office, formal dining area, two and a half baths and two car garage. Open to the dining room, kitchen offers custom-designed cabinets, stone countertops and stainless steel appliances. Additional upgrades include tray ceilings with plenty of lights, diagonal tiles in the main area, and upgraded and very spacious master bathroom. Alfresco living defines the Floridian lifestyle with an exquisite oversized lanai with a salt water, heated swimming pool, facing the preserve and it is perfect for entertainment or relaxation. Hawthorne is a gated community with a guard and offers a diverse range of venues and activities to support all lifestyle types. Residents enjoy two clubhouses, two fitness centers, tennis courts and two pools. It is only minutes from some of the best beaches, shopping centers, the airport and the best dining and entertainment Southwest Florida can offer. Hawthorne Homes: OWNER FINANCING OFFERED!! Beautiful 3 Bedroom+Den/4 Bath on CORNER LOT in Hawthorne(FURNISH NEGOTIABLE). Hawthorne is guard gated with 2 clubhouses, 2 heated pools & spas, tennis & pickle ball courts & 2 gyms. LOW HOA covers cable, landscape, garbage & weekly social events. Walking distance to Downtown Bonita. Airport, beaches, theatres, dining & Coconut Point Mall just minutes away. Lanai enclosed HEATED POOL & HOT TUB w/ LONG LAKE & SUNSET VIEWS! Vaulted ceilings & beautiful hard wood floors. Kitchen has custom cabinets w/ slide-outs, granite counters & backsplash. 2 bedrooms (including Master) conveniently located on first floor. 3rd bedroom upstairs (2ndMaster) w/ built in bookshelves, TV cabinet & benches is large enough to add 4thbedroom. Masterbath has walk-in shower & large soaking tub. Upstairs Den has 6 custom bookcases, built in TV shelf & window seating. Large laundry room w/ front loading Washer/Dryer, sink & cabinetry. Other UPGRADES include granite counters tops, upgraded tile, upgraded cabinetry, central vacuum system, Hunter Douglas shades, custom window treatments, Intercom/radio & smart home features. Garbage disposal, pool heater & pump recently replaced. Cobblestone Hawthorne Homes: Beautiful and spacious 5 bedroom home situated at Hawthorne in Bonita Springs. Over $100,000 in upgrades when the home was built, including solid wood cabinets, marble counters, upgraded appliances, crown molding throughout, tray ceilings in master bedroom and loft, upgraded ceiling fans and bathroom upgrades as well. This is the perfect family home with an open floor plan, formal dinning room along with a breakfast room overlooking the serene lanai. Your family will spend hours enjoying the second floor loft space large enough for a TV viewing area and a pool table! The lanai and pool area is very private with beautiful landscaping and a wonderful view of the lake and features a saltwater system for the pool and space for outdoor dining. Hawthorne is ideally located between Imperial Parkway and Old 41 and includes 2 community pools and spas, 2 fitness rooms, community room, tennis and numerous community activities and clubs. From there, it's any easy drive to nearby beaches, Coconut Point Mall, Miromar Outlets and SW Florida International Airport. This is the perfect package, a magnificent home in a desirable community and outstanding location in SW Florida! Florida at it's best! Emory Oaks Hawthorne Homes: Light, bright and gorgeous entertainer's delight in the conveniently located gated community of Hawthorne. Situated on private lakefront homesite offering comfort & tranquility from your oversized private lanai. Built by Centex in 2012. Many upgrades throughout this home, Custom Glass Doors, Crown molding, Stone Front, 18' on diagonal tile floors, great room with tray ceiling, wainscoting in breakfast nook with expansive mitered window view of the lush outdoors, Smart thermostat, Security Cameras, Insulated garage door, Storage racks in garage. Open floor plan showcases a chef's kitchen featuring granite counter tops and stainless appliances, New GE Cafe refrigerator (2018), 42' cabinets, pantry, and convenient access to the formal dining room. Freshly painted interior, garage and garage floor, The luxurious master suite with gleaming real wood floors and luxurious master bath is highlighted by the large, easy care no-glass walk-in shower and separate garden tub. Electric hurricane shutters on the lanai give peace of mind and turn the extend lanai into another room for entertaining no matter the weather. This home shows like a model and is meticulously maintained. Emory Oaks Hawthorne Homes: INCREDIBLY PRICED $167.51SQ.FT, 2562SQFT! THIS IS A WELL CARED FOR SALEM MODEL, Hawthorne's favorite floor plan!This beauty has all the bells and whistles, Fine appointments include TILE FLOORS throughout, beautiful WOOD CABINETRY in kitchen, baths and laundry, GRANITE COUNTER TOPS, black appliances, tumbled marble backsplash, CROWN MOLDING, PLANTATION SHUTTERS and other fine window treatments, A nice sized pavered LANAI LOOKS OUT TO PRIVATE PRESERVE and lovely yard. Master Suite with Walk in closets. A BEAUTIFUL MASTER BATH WITH A ROMAN TUB and wonderful WALK THRU SHOWER. LOCATION: Hawthorne is "Special Gem" conveniently located in Central Bonita Springs. The community is gated with 24 hour security and amenities which include two pools, two spas, two tennis courts, two fitness centers, a Clubhouse and Community Room. Enjoy walking, biking and running through the lake filled community,Socially active with monthly social events, card groups, men and women luncheons, community outings, book clubs, game nights and more. Hawthorne is conveniently located to fine grocery shopping, restaurants, Coconut Point Mall, Miromar Outlet Mall, RSW Airport, Naples and Fort Myers. ROOM FOR POOL! Cobblestone Hawthorne Homes: Here is the open floor plan concept you have been looking for with all the room you have been looking for in the location you have been looking for-3+Den and 3 full baths. Enjoy your Florida retreat with a peaceful lake view from your pool and spa. You can purchase this home turn-Key furnished if desired. This home sports fine appointments such as Wood Cabinetry in the Kitchen and Master Bath, solid surface counter tops, stainless appliances, Plantation Shutters, soft color throughout home, LED high hat lighting and tile on the diagonal and an AQUA LINK POOL SYSTEM The home has been recently power washed and shows beautifully. Hawthorne is a Jewel of a community centrally and conveniently located in the center of Bonita Springs. Getting anywhere from Hawthorne is a piece of cake! Airport, Beaches, great Super Markets, Restaurants, Malls and easy trip to either Naples or Fort Myers. The community is very friendly and social with a group for everything and everyone, social events both in and out of the community. There are beautiful lakes, 2 pools and spas, great Fitness Facilities, Community Rooms and Tennis Courts. This is a great community!!! Emory Oaks Hawthorne Homes: Model home condition. Absolutely stunning 2 BR + DEN and 2 Car Garage with an open floor plan in a maintenance free private gated community. This home sits on the best preserve views with a sunset exposure and wonderful natural light. Hawthorne is conveniently located off Imperial Parkway, close to Shopping, Restaurants, Coconut Pointe Mall, Shoppes at the Promenade, Miromar Outlet, RSW Airport and Southwest Florida Best Beaches. This home is like new and is waiting for the perfect buyer, clean as a whistle. Features include solid wood cabinetry thru­-out, granite counter tops, tile flooring, tray ceilings, Fans and so much more. Hawthorne's Amazing amenities including a huge Pool & Spa, two tennis courts, Fitness centers, Jog and Bike Path, all in a gated community for some extra security. The community is social with monthly social events, card groups, men and women luncheons, community outings, book clubs, game nights and more. Great investment potential for annual or seasonal rental. Call to schedule your appointment today!!! Emory Oaks Hawthorne Homes: PRICE REDUCTION! ONE OF THE BEST PRICED HOMES IN EMORY OAKS! FANTASTIC WATERFRONT property is one of the best in the community plus located in the desirable Emory Oaks neighborhood! Enjoy the expansive back yard & water frontage. There is plenty of room for you to extend the lanai or add your private waterfront pool & spa. This home has been freshly painted throughout, new carpet installed in all bedrooms, new ceiling fans, and more…ready for you to move right in! Two living areas...a living room plus a family room with. A wall of windows that provides you with a great view of the lake from the family room, kitchen, breakfast area, and living room. Plus, this is one of the few homes in Hawthorne with a side entry garage. The location is convenient for shopping, restaurants,airport, and trips to the beach. Make sure you take a look at this one and put it at the top of your list! Hawthorne Homes: This true 4 bedrm/3 bath lake view former model home, with tiles and new laminated flooring, is located at the heart of Bonita Springs between Ft. Myers and Naples in a 24-hr. man-gated community with lots of amenities. Minutes to Riverpark to enjoy free concerts, fireworks, art events and etc. Short drive to the beach and Coconut Point Shopping Center, the largest mall in SWFL, and International Airport (RSW). Brand new 70+ acre Bonita Springs high school just minutes away. A must see. Won't last! Need professional assistance selling your property at Hawthorne Bonita Springs? Find out how an Area Specialist can help to generate more property exposure in order to get the most money for your investment in the least amount of time.